Another original artwork part of the book I illustrated. This chapter was about the same wise ant that gave counsel to the Donkey in a previous post...and the story goes like this, the ant was attending to Jungle School and all the other animals mocked her for being tiny and fragile, that she wouldn't last long enough etc. Then the ant proceeded to cut the wood piece into tiny bits so the water could flow and be drained out of the room. 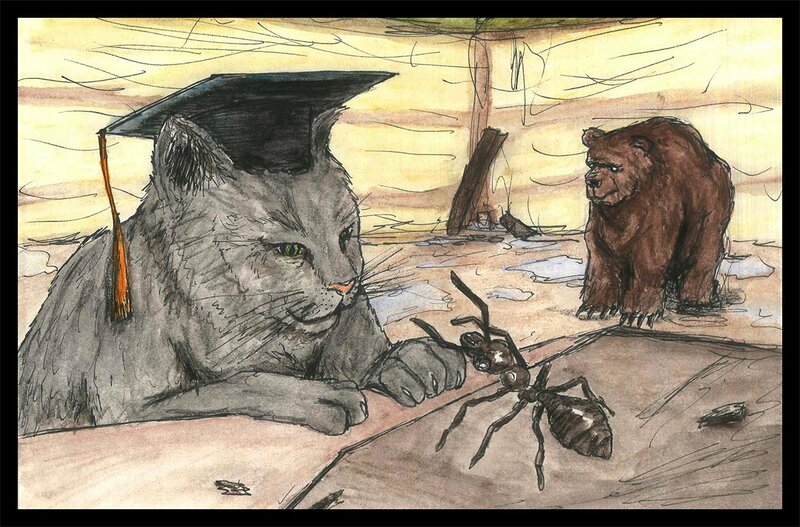 From then on all the other animals started to respect the persistence and analytical mind of her, no one ever mocked the ant from that day on, and she even received praise from the headmaster Cat. Well that was the story behind, I struggled a bit on how to represent all this into a single picture...but I think I did it well in the end, the Author was pleased so...that was fine with me hehe. I did this drawing on my A5 sized sketchbook using mechanical pencil, inkpens, aquarellable colour crayons. then it was slightly edited with Adobe Photoshop.